A ground-level illustration of how the plague ravaged Europe. For his tenth book, science writer Kelly (Three on the Edge, 1999, etc.) 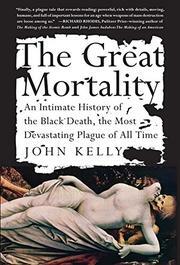 delivers a cultural history of the Black Death based on accounts left by those who witnessed the greatest natural disaster in human history. Spawned somewhere on the steppes of Central Asia, the plague arrived in Europe in 1347, when a Genoese ship carried it to Sicily from a trading post on the Black Sea. Over the next four years, at a time when, as the author notes, “nothing moved faster than the fastest horse,” the disease spread through the entire continent. Eventually, it claimed 25 million lives, one third of the European population. A thermonuclear war would be an equivalent disaster by today's standards, Kelly avers. Much of the narrative depends on the reminiscences of monks, doctors, and other literate people who buried corpses or cared for the sick. As a result, the author has plenty of anecdotes. Common scenes include dogs and children running naked, dirty, and wild through the streets of an empty village, their masters and parents dead; Jews burnt at the stake, scapegoats in a paranoid Christian world; and physicians at the University of Paris consulting the stars to divine cures. These tales give the author opportunities to show Europeans—filthy, malnourished, living in densely packed cities—as easy targets for rats and their plague-bearing fleas. They also allow him to ramble. Kelly has a tendency to lose the trail of the disease in favor of tangents about this or that king, pope, or battle. He returns to his topic only when he shifts to a different country or city in a new chapter, giving the book a haphazard feel. Remarkably, the story ends on a hopeful note. After so many perished, Europe was forced to develop new forms of technology to make up for the labor shortage, laying the groundwork for the modern era. Occasionally unfocused, but redeems itself by putting a vivid, human face on an unimaginable nightmare.